Validation provides confirmation that a product or process meets pre-defined specifications and is fit for purpose, i.e. meets quality, reliability, regulatory & customer requirements. A comprehensive knowledge of validation is a necessary tool for engineers, product and process designers, quality assurance personnel, production and training staff, supervisors and managers at all levels. 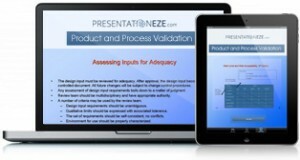 An understanding of product and process validation requires an appreciation and knowledge of the benefits associated with effective validation, an understanding for when validation is appropriate versus verification, the ability to integrate risk assessment into a validation program, understanding of validation documentation, … etc..